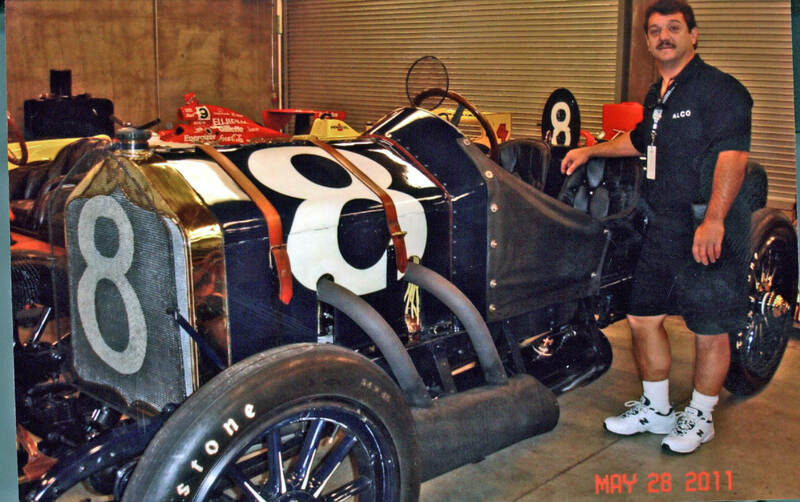 The Black Beast's master mechanic Sam Greco and the 1912 National. The National was driven by Bobby Unser during the second parade lap of the 2011 Indy 500 pre-race ceremonies. The second running of the "500" in 1912 was won by a stripped down version of a National passenger car, prepared and entered by the Indianapolis-based National Motor Vehicle Company. Driver/engineer Joe Dawson, who was on loan to National from Nordyke & Marmon (winners with Ray Harroun in 1911), led only the final two laps, taking over when the Mercedes of Ralph DePalma broke down within sight of the finish. The National's four-cylinder engine displaced a hefty 491 cubic inches, making it the largest ever to win. It was a 1912 National, built just six miles from the track by the National Motor Vehicle Company of Indianapolis. This local firm started building electric cars in 1900 and three years later switched to internal combustion engines, building cars until 1924. True to the original spirit of the Indy 500 rule book—which was to encourage passenger car development through racing—the National was essentially a factory touring car with superfluous bodywork stripped away. Quite an engine in this thing, lurking behind that brass radiator. A huge 491-cu.-in. 4-cylinder—the largest engine ever to win the Indy 500. (That’s about 2 liters per cylinder—or approximately one Triumph TR-3 engine for each piston.) The engine is a T-head design with the intake and exhaust valves sitting in their own little chambers, outboard of the cylinders, and two sparkplugs per cylinder. Nothing very exotic here—just big. Rear axle and solid beam front axle both on leaf springs; 3-speed transmission with reverse. Big blue 50-gal. gas tank sitting like an oil drum behind the seats, and an actual 10-gal. oil tank at the side of the car. 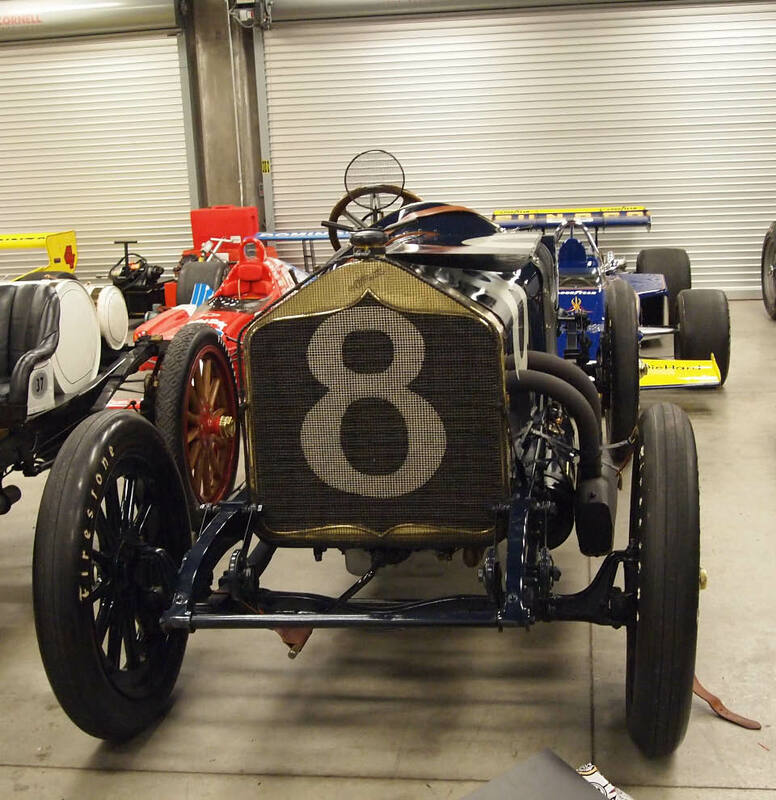 The driver of this rig was Joe Dawson, who’d finished 4th in a Marmon in the 1911 inaugural 500. His brave mechanic, according to Speedway Historian Donald Davidson, was one Harry Martin, an engineer employed by National. The car took 6 hours, 21 minutes and 6 seconds to finish the 500, at an average speed of 78.719 mph.